One of Marquee’s own, 22 year old dancer Courtney Robinson, was recently diagnosed with brain cancer. Despite this diagnosis turning her world upside down, she ran a fundraising campaign for brain cancer research and raised over $6000 in a matter of days. Recognising Courtney’s efforts and to help support ongoing medical costs, Marquee’s Programming Manager & Artist Liaison Travis Grech and director of Breeze Entertainment Bree Kent spearheaded both an online and internal fundraiser. 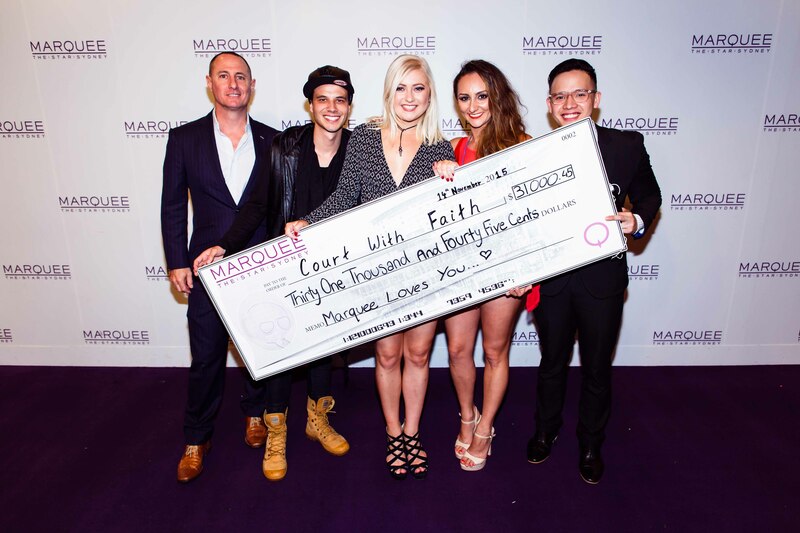 Through extremely generous donations from the likes of Will Sparks, headline DJ’s and guests on the nights of 13th and 14th November and the entire Marquee Sydney team, $33,577.80 was raised and presented to Courtney. Will Sparks, Brooklyn, I am Sam, Zannon, Walden, Jay Sounds, J-Trick, Johnny Gleeson, Troy T, Zerocool, Jason Kappos, Ashwin Arumugam, Bree Kent, the Marquee dance team, bartenders, bar backs, bussers, VIP hosts, cocktail waitresses, Marquee management and the owners of Marquee.